This was tucked in a far back corner of the main hall. I didn't ask. For anyone remotely interested in outdoor gear, the annual Outdoor Retailer show in Salt Lake City, Utah, is an exciting event, overwhelming in the scope and sheer volume of products. If you’re as fascinated by equipment as I am, you’re likely to find yourself humming the tune to Babes in Toyland as you enter the main hall and inhale the scents of Gore-Tex, carbon fiber, nylon, and titanium. Okay, none of those materials really has a scent, but you get my meaning. I’ve been attending OR since the early 1990s, when it was still held in Reno, Nevada. (Persistent legend holds that the show was simply not invited back there one year when Reno officials belatedly realized that the attendees weren’t gambling or buying tickets to Englebert Humperdinck concerts.) Over the years, the show has had its minor ups and downs, but the 2009 and 2010 SLC post-Great-Recession ORs were scary in their dearth of both exhibitors and new products. Like the automotive industry after WWII, most companies simply recycled products with new colors rather than invest in development, while they waited to see in which direction the economy would go. In 2012 the tide seemed to have turned. The Salt Palace Convention Center was packed with both exhibitors and attendees, the mood was buoyant, and I fully expected the 2013 show to be full speed ahead. What I found was, to sum up a complex situation in one word . . . ennui. What can I say about a show in which one of the most interesting products I noticed was a tent stake? That might be too harsh, but not much I saw belied the viewpoint. For years the centerpiece of the south hall area was some form of climbing wall, open to anyone who cared to give it a try and always busy. Gone. Move north along the main aisle and you’d hit the big indoor pool where kayak manufacturers demonstrated their new models. Gone. Versions of both have been banished to the “Pavilions”—county-fair-sized tents north of the convention center, where new and/or underfunded companies hope to strike gold. The only “outdoor sport” in evidence in the main building was a slackline manufacturer’s demonstration area. Indoors and 12 inches off the floor, a slackline (basically a tightrope employing a strap rather than a rope) strikes me as something pinched from a county fair booth where you might win a stuffed animal if you can stay on it for ten feet (those who practice it over 2,000-foot chasms are, of course, in a different league). Yet, indeed, there seemed to be no shortage of clothing manufacturers—even Carhartt, traditionally a blue-collar supplier to construction workers and cowboys, was getting in on the craze, and touting their seniority to effete upstarts such as Mountain Khakis. Is this clothing/lifestyle thing really a trend, or did I employ motivated reasoning to reinforce unfair first impressions? Perhaps next year will tell. Anyway, enough expostulating. Three days at OR were enough to ferret out a few products of note. Some were brand new and intriguing, some I had dismissed previously as unlikely to survive, but re-evaluated on their second or third appearance. A traveling coffee pot one inch high . . .
Coffee being uppermost in my mind each morning, I should start with the brew-in-bag product from Nature’s Coffee Kettle. It comprises a two-compartment foil pouch, in the top of which is a hermetically sealed packet of ground coffee of various flavors. You zip off the top, slowly pour in 32 ounces of boiling water, and the brewed coffee collects in the bottom section, from where it can be poured out through a screw cap. The sealed packet can be folded to take up a space no larger than six by eight inches by an inch thick. Although the product has been around a while, I never paid attention since the bag appeared to be a one-time-use-then-it’s-trash product. However, this time I stopped and spoke to the inventor, Matt Hustedt, who assured me the packet of grounds can be replaced, so the foil “kettle” could be used a half-dozen times or more. I brought a couple samples home and tried the organic Columbian. After opening the top and eyeing the packet of coffee, I cut the amount of water I poured in to 24 ounces, and in addition, as Matt had suggested to enhance the boldness, upended the kettle several times to recycle the water through the grounds (be sure to rezip the top if you do this!). The verdict from this fan of strong, high-quality coffee, was . . . bravo. The flavor and strength were surprisingly good, although I’m glad I cut the water. I suspect the brew would have been even better if I’d poured in the water more slowly at the start. While some (especially motorcyclists) might use the Nature’s Coffee Kettle as a primary travel brewing device; given its sealed nature (Matt claims to have brewed good coffee with two-year-old pouches) and nearly flat dimensions, I’m thinking one or two of them would be good backups to keep stashed somewhere in case you ran out of your Tanzanian Peaberry beans in the backcountry, or your hand-cranked burr grinder explodes and you can’t find a metate. While on the subject of beverages, let’s move later in the day and talk about freeze-dried beer. Backcountry soda and . . . beer? No, I’m not kidding, although “freeze-dried” is a deliberate misnomer. Like many of us, Patrick Tatera often wished for a way to enjoy good beer far in the backcountry, without the exertion of carrying it there. Rather than try to brew beer and then dehydrate it, he invented a method of brewing the “beer” parts of beer—i.e. the malt, hops, alcohol, etc.—into a concentrate. He then invented a bottle called a carbonator, which infuses that concentrate into the ice-cold mountain spring water you’ve collected 15 miles into your backpacking trip, and carbonates the lot. The result? Well, I’m not sure what the result is, as I haven’t yet tasted the finished product. But Patrick claims to be a devotee of high-quality beer, and none of the available brews claims to replicate PBR, so I plan to follow up and report. Pat’s Backcountry Beverages, as the company is known, also produces concentrates for soft drinks. I’ll try those too. About that tent stake: It’s from UCO, a division of Industrial Revolution. It looks like an ordinary V-shaped aluminum tent stake, except for the cunning little LED light that slips over the top once you’ve pounded in the stake. Powered by a single AAA cell, it can be set to a 17-lumen constant glow, or a strobe. Besides obviating those headlong trips over tent stakes we’ve all accomplished, it will locate your tent for after-hours hikes. Neither the 10-hour burn time on constant nor the 24-hour life on strobe strike me as particularly efficient; I think they could halve the lumens and still effectively light the stake. At the Industrial Revolution booth I also picked up some of their stormproof matches. These aren’t your ordinary stormproof matches: Strike one, and when its orange secondary material is burning fiercely, dunk it in a glass of water. Pull it out, give it a shake—and it will keep right on burning. Impressive. To go with them in my survival kit I added some Flame Sticks from Ace Camp. These green plastic sticks look like flashing from some molded product; you’d toss them in the trash if you didn’t know better. But once lit they’re reported to burn powerfully for five minutes, which is exactly what I got out of one in a light breeze. The sticks are too long to fit in the waterproof case the matches came in, so I clipped the ends off a half-dozen. There should be few circumstances in which I couldn’t get a fire going with this combination, except at the bottom of a pond. If you can't light a fire with these, turn in your merit badge. Over the years I’ve tried several brands of cargo nets to secure those awkward loads in the cargo bay of Land Cruiser wagons, Wranglers, and Defenders, or on roof racks. I’ve hated all of them. It’s nothing to do with the products, really, it’s just that to wrap a variety of objects in a variety of vehicles, they wind up being huge, tangle-prone, and awkward, and more often than not snug nicely around half the contents while leaving the rest bouncing. But frequently ratchet straps just can’t encompass everything that should be secured. So I’m cautiously excited by the Lynxhooks interlocking tiedown system, a completely modular and infinitely expandable product comprising individual straps with adjustable buckles, a short length of natural rubber bungee, and a pair of hooks. The hooks are the clever part, as they can either connect to a tiedown point or snap to another hook—or five or ten other hooks—to create a custom-sized and custom-shaped spider of straps (or, of course, each strap can be used as . . . a strap). I got a sample, but plan to ask for more to create a net for the back of my FJ40. I’ll report in full then, but I don’t see how they wouldn’t work as advertised. The Lynxhooks snap together to form custom cargo nets. Finally, on to more advanced equipment. I walked past a booth in one of the pavilion tents and spotted a bunch of little square bricks perched here and there, each proclaiming “Text Anywhere.” I thought they were just cute displays, but it turns out they’re the actual device: Connected by wi-fi to any smart phone, they utilize the worldwide Iridium satellite system to allow two-way text messaging from pretty much anywhere on the planet. The device is $399, a subscription including 100 texts is $30 per month, you can idle the account for $5 per month, and it’s compatible with Apple, Microsoft, Android, Linux, or Blackberry operating systems. I wheedled the sales manager, Garry Harder, into sending one home with me then and there. I’ll review it soon, then we plan to take it to Kenya this fall where we’ll be working on another project with the Maasai and will be in the proper area for a real test. If it works as promised, it will be a huge step up from the typical one-way SPOT-type device. TextAnywhere plus a smartphone = global texting. More as I sift through 20 pounds of dealer catalogs, scribbled notes, and iPhone photos. 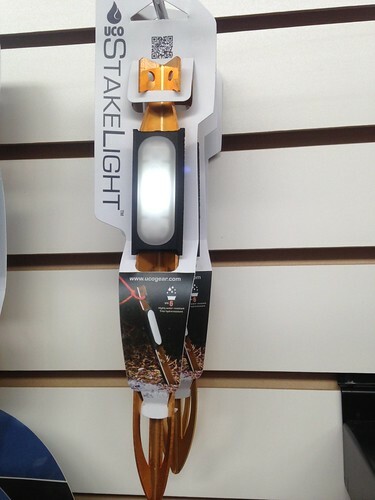 See our Flickr set Outdoor Retailer 2013 for more images of interesting products not covered here. Nature's Coffee Kettle is here. Pat's Backcountry Beverages is here.